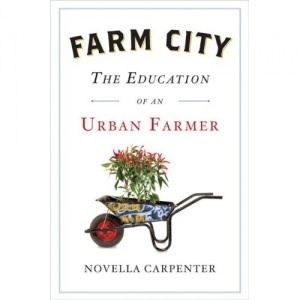 So the week began with Paul McCartney’s plea for Meat Free Mondays and ended with Michael Pollan and Novella Carpenter discussing slaughtering chickens, rabbits, goats, and pigs for dinner. Linda McCartney just rolled over in her grave. Meanwhile, I’m probably the only person alive in Berkeley who hadn’t attended a Michael Pollan food chat. As advertised, the man who urges us to Eat food. Not too much. Mostly plants. is accessible and charming and graciously played the role of the proud professor lavishing praise on his student and her success. But here was the real take-home message from the evening. Carpenter, the relative newbie to food writing, asked Pollan whether this whole obsession with what we eat isn’t getting a little out of hand. Pollan used the opportunity to point out that the politics of food is just getting interesting, now that there’s an administration that gets why it’s important to reform this country’s food system. Of course, as he pointed out, it’s one thing to “get it,” and quite another to bring about change. That’s where the First Lady of Food comes in. It seems Michelle Obama is on a mission to raise people’s consciousness about our diet. 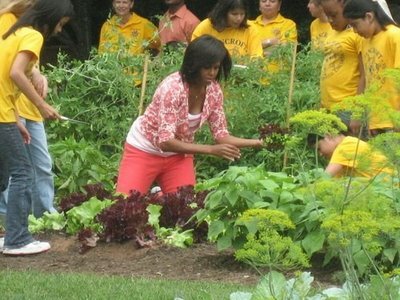 The White House Victory Garden was just the beginning; this week she revealed a plan detailing how to profoundly alter the way we eat. Pollan thinks if the Obama administration can get people to realize that to carry out health care reform the country also needs to overhaul its food industry (drawing the connection between obesity, type 2 diabetes, and skyrocketing health care costs) then maybe real change is possible. That’s something to chew on. To learn more about what Michelle’s got cooking on the culinary political front follow her every food move at Eddie Gehman Kohan’s amazingly exhaustive Obama Foodorama blog. Yeah, I was starting to get jaded by all the Michael Pollan events I had attended, but then he stopped, and I realized how lucky I was to live near him and have access to his thought process and those of his colleagues, like Alice Waters and Marion Nestle. I put a hold on Carpenter’s book at the Oakland library. Only 17 people ahead of me. I’ll have to find that book at my library! I wonder if I can get it on audio yet? Never crossed my mind about the library thing-but good idea–perhaps I’ll borrow it from Dianne before she returns it, sigh. But seriously–it was an interesting discussion last night, and thank you Sarah for digesting it all in this nice little blog posting, making the link from London to Washington, too. I hadn’t heard about meat-free mondays, but I rarely eat meat on mondays, anyway. And yes, Novella was hilarious, and swore like a sailor as the NY times article mentioned. You gotta love someone like her! I’ve done the whole gauntlet of Food these past ten years. Me? I’m going back to Weston A Price and Nourishing Traditions! It’s so simple! Yeah and I’d like to see Sir Paul go into a country that relies on meat for their food and tell them to go Meatless on Mondays! Get real Sir Paul!